Is it a berry? Is it a pink? Can we call it a berry pink and be done with it? 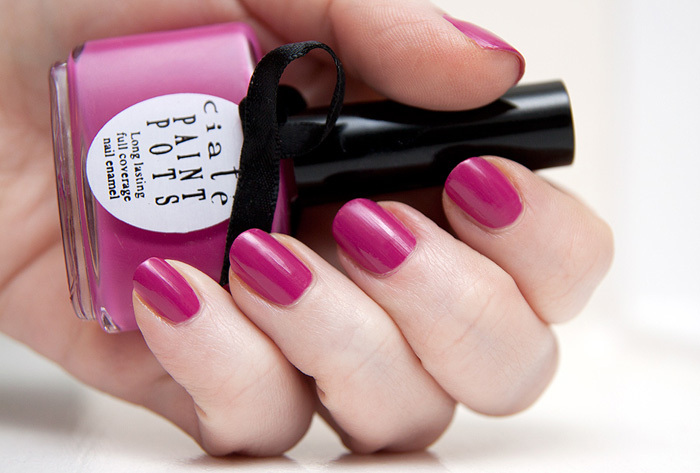 Ciate Main Stage is a lovely rosy pink (I thought we were going with berry?) shade. I do love pink… not for my clothes or things around me but chuck a pink lippie or polish at me and I’ll doll myself up quicker than Barbie would topple over were she made of flesh and bones. As with most Ciates, the formula leans a little thick but gives great coverage. Shown above without a top coat. Ohh I love this. Not only is the colour great, but I am IN LOVE with the Ciate bottles, they are by far my favourite nail varnish bottle design! “quicker than Barbie would topple over were she made of flesh and bones.” – LOL!!! Don’t know what it is but it’s GORGEOUS! I like this, but I prefer and average-to-thin formula. Thick formulas are a Pain in the behind, for me. I L-O-V-E this colour! I look forward to buying this! Whoa, what a gorgeous colour! It’s a shame it’s £9. Not that I don’t love this berry shade, but I am beginning to feel like there are WAY to many pinks being released at the moment. It’s a bit of overkill.